At NuBoyana FX we are focused on providing top quality visual effects, animation and VR experiences for larger scale film productions, commercials and music videos. Our passionate team gathers people who have worked at some of the biggest and best VFX companies in the world.Because of that we are constantly on the lookout for new talent. The NBFX signature is a mix of creative thought, the latest of technology and a strong personal touch. We care for the people we work with, both inside and outside of the studio. The rigger is responsible for producing high-quality rigging and skinning for our CG models. 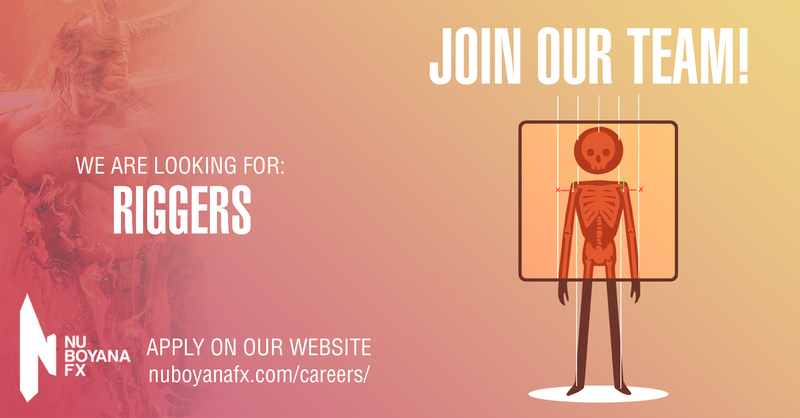 If you have a passion for rigging, can use Maya and are comfortable with Mel or Python scripting then we want to hear from you, whether you’ve just graduated, are looking for new challenges or are used to leading teams of Riggers – we want to hear from you!